WORLDPAC Industry News "WIN": New WORLDPAC Ad Campaign and Monthly TV Sweepstakes! New WORLDPAC Ad Campaign and Monthly TV Sweepstakes! New WORLDPAC Advertising Campaign and TV Sweepstakes! WORLDPAC recently launched a new advertising campaign for 2010! 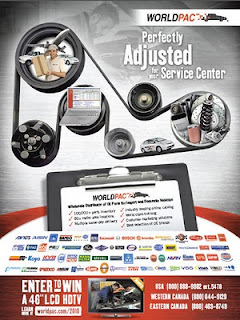 The campaign theme communicates why WORLDPAC is Perfectly Tuned for Your Service Center. WORLDPAC stocks more than 100,000 parts for over 1,000,000 vehicle applications! The fact is, by the time new cars hit the road, replacement parts are in our system, ready for you to source. WORLDPAC imports parts directly from the most respected OE manufacturers in the automotive industry. Sourcing the original parts from the original manufacturers ensures the precise fit and easy installation the first time, as well as the quality that maintains the integrity of the vehicle. WORLDPAC’s industry leading speedDIAL online catalog and fulfillment ordering system features 24x7 real-time pricing and availability on multiple product brands as well as online self-service returns, 50,000+ high-resolution color product images, VIN decoder and integrated AAIA ACES vehicle identification recognition, as well as WORLDPAC Forums which puts you in contact with thousands of repair technicians sharing ideas and business solutions throughout North America. Leveraging the organization and efficiencies of our 80+ strategically located facilities (including locations in the U.S., Canada and Pureto Rico) is the backbone of our commitment to delivering the right part at the right time. Our company-owned fleet of vehicles and drivers provides multiple same-day deliveries to most major metropolitan areas. Our proprietary Electronic Delivery Verification System allows prompt and accurate order fulfillment as well as paperless delivery, increased order accuracy, estimated delivery times, digitally stored proof of delivery, and real-time account receivables updates. We also offer nationwide overnight service for dependable and consistent overnight delivery to every address in North America. You might ask yourself, "what does this mean for me and my service center business?" We are glad you asked! It means WORLDPAC's timely and consistent delivery service can help you increase technician productivity while decreasing your inventory levels which results in increased revenue and decreased expenditures! WORLDPAC understands that marketing your independent service center can be challenging. That is why we offer “turn-key” marketing services to assist you with your marketing plan. Depending on your goals, WORLDPAC offers various acquisition (gain new customers) and retention ( retain and grow current customers) marketing solutions. To learn more about the difference between acquisition and retention marketing strategies, download our Customer Marketing Solutions (CMS) brochure or request that your Sales rep send you a copy today. Available customer marketing solutions include direct mail, service reminders, shop calendars, post-service feedback surveys and more. Our mission at the WORLDPAC Training Institute (WTI) is to assist customers in growing and increasing the profitability of their business through education. Our technical program provides advanced level diagnostic training designed explicitly for independent repair professionals. View technical training. Our business development program provides training in the management of the repair shop business. Skills include how to increase productivity and profits, as well as how to best manage difficult areas of the business including financial management, employee management, marketing and service adviser training. View business development. To celebrate the new campaign, WORLDPAC is giving away a 46" LCD HDTV each month during the 2010 TV sweepstakes giveaway! Visit the campaign website (www.worldpac.com/2010) each month to register for your chance to win. It's that simple! Register to WIN today! Monthly winners will be featured on the WORLDPAC Sweepstakes Winners Hall of Fame web page. View WORLDPAC's new advertisement live on the back cover of Motor Age magazine's February 2010 digital issue.